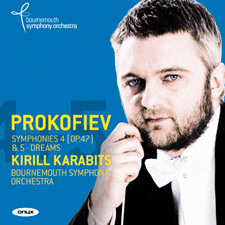 The third volume of the Bournemouth Symphony Orchestra’s acclaimed Prokofiev symphony cycle under their charismatic Chief Conductor Kirill Karabits reaches arguably the most popular if not the greatest of the composer’s seven symphonies – the epic 5th. This composition was written in 1944 during the height of the Herculean Russian struggle to defeat the Nazi invasion. The Prodigal Son ballet for Diaghilev provided the material for the 4th Symphony of 1930, a commission from the Boston Symphony Orchestra and Serge Koussevitzky. The composer was to revise this work in 1947.